Our classic Retro Barstool Model 400-49NS features a scalloped ring swivel seat, pyramid base with foot ring. Available in your choice of standard or our zodiac and cracked ice premium designer vinyls. A good fit for any restaurant, cafe, kitchen, or dining area. Our barstools are rated for up to 400 lbs. and carry a lifetime structural warranty! If you are looking for quality and best priced bar stool, look no further. 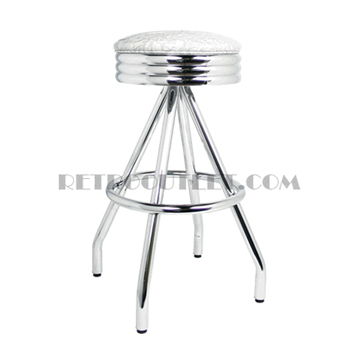 Please allow 4-5 weeks for production of your retro barstools manufactured per your specifications.